I don’t know many people that would willingly lend a complete stranger a few hundred dollars. You can’t trust anyone these days – or at least that’s what my grandma tells me. But she’s right. We live in a world where people can’t fall asleep unless they know their front door is locked; a world where locking your car doesn’t always keep people from stealing your iPod or wallet. This past summer I went for a long solo run on mountain trails through Grand Teton National Park. When friends and family heard that I went by myself, most responded with, “wow, be careful out there” or “really, you’re not scared?”. And they weren’t referring to the bears or potential storm clouds – they were referring to the people. Maybe it’s for good reason, but the climbing community has reminded me that although there may be a great deal to fear in today’s world, there is also an amazing amount of generosity and kindness. When Adam and I stopped at Zion National Park in May of 2013, we had one main objective – Moonlight Buttress, the perfect flaw running roughly 1,200 feet up a prominent buttress. We had just left Red Rocks, where we had indulged in climbing our first big wall and it had left us hungry for more. But our hearts sank. We checked SuperTopo, Mountain Project, the guidebook, all the usual places for climbing beta, and each resource confirmed what we already knew. We needed more gear if we were going to attempt to climb Moonlight Buttress. Anyone who has spent time climbing in Zion knows, like Indian Creek, you need a fairly robust rack in order to climb a good deal of the routes. The fiery sandstone walls are dripping with pitch upon pitch of perfectly splitter cracks. The uniformity of these cracks, which is what draws climbers to them in the first place, also means that you need multiples of the same sized cam to safely protect a pitch. Multiples, as in up to six of a single cam size! We sorted through our gear. To our disappointment our cams had not multiplied during the drive from Nevada to Utah; we barely had more than a standard single rack. 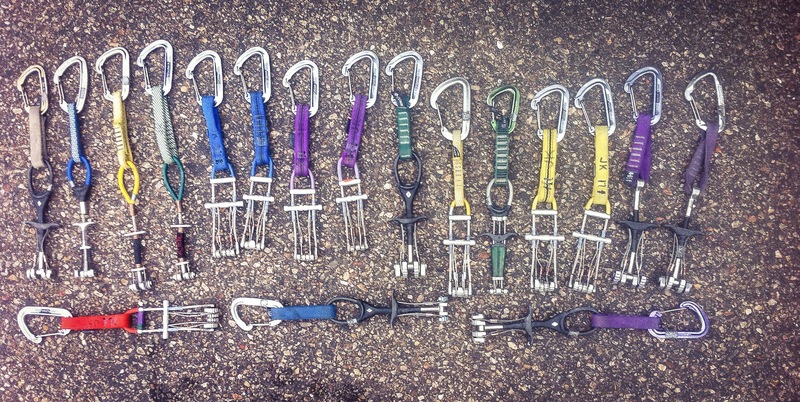 The previous day we had made the tedious ascent of climbing a single pitch splitter crack with this same meager rack. I’m fairly confident Adam spent more time lowering to back clean gear, than actually climbing. As for me, I never even touched rock that day. By the time Adam made it to the anchors, we had to race back to the road to catch the last shuttle of the day out of the valley. We might have been able to climb Moonlight Buttress with our rack if we had a month to spend on the wall or nerves of steel to run it out on every pitch, but we were hoping for a single day ascent and living through it was a must. I knew our ultimatum: get our calloused fingers on more than three times the amount of gear we already had, or leave Zion without a single chalk mark on my pants. We spent a couple days hiking in the park. It was as if we thought leaving two one-inch cams in the van alone for the day, might result in the conception of three more .75-inch cams. Luck was not on our side. We lingered in the local gear store. Buying all the extra gear we needed would cost over $1,000. It was obvious this was not a viable option. So that was it – we had exhausted our options. We decided to spend one more day in the park, crawl into the van, and leave the sandstone walls in our rear view mirror. And then, that evening while cooking dinner it happened. Two unkempt guys wearing cheerfully colored down jackets were cooking dinner on a camp stove less than a rope’s length away from us. I knew they were one of us as soon as I saw them. When Ari and Jason found out we wanted to climb Moonlight Buttress a light of enthusiasm jumped into their eyes. Ari reminisced about time he had spent cruising up the clean cracks of this wall. The vivacious sandstone had called out to him, just as it was calling out to us. Our jaws dropped. We had been talking to these guys for only 10 minutes at this point. Their generosity was inconceivable, and all because they wanted us to experience this beautiful piece of climbing that they already had the pleasure of experiencing. I couldn’t help but wonder – what if we were unreliable and never mailed the gear back. But we aren’t, and they knew it somehow, just as we had known they were climbers without any trace of climbing gear. It’s truly amazing what the shared passion of climbing can do – how closely it can bring two complete strangers together. It’s not something you come by often. Odds are the person you pass in a golf course parking lot isn’t going to lend you their clubs for a few days – and the couple sitting at the table across from you at a restaurant isn’t going to lend you their iPhone. But climbing is different. It tends to attract a certain type of person. The type of person you would trust to watch your laptop and backpack while you run back to your car to grab a jacket. I don’t know many people that would lend a complete stranger several hundred dollars, but that’s essentially what Ari and Jason did for Adam and I. And why? Simply for the love of climbing. Hi! My first thought upon hearing that you were short gear was “bummer, I’d totally loan you whatever you guys need if I was there that day, or if you stopped by SLC before heading down to Zion!” Funny that another climber had the same thought and was in the cosmic position to help! Lucky you, and congrats on the climb. Great piece of writing, I look forward to more! Thanks for the offer anyways! Maybe you’ll come across someone in my situation and get to help them out! I’m not family by blood, but by climbing and I love your writing! Also love any blog where family is in the blogosphere supporting you! Keep it up! Thanks for the support! Glad to have another climber on board!